Our Healing Services take place on the 5th Sunday of the month at the Contemporary Service. At the healing services, there is a time set aside in the service where anyone in the congregation is welcome to come foward for prayer at one of two stations set up in the front of the church. Once the person is seated, the prayer ministers will pray and lay their hands on the person's head or shoulers. While prayer requests can be made at this time, it is not necessary to explain why prayers are needed. The Holy Spirit leads the prayers. Other members of the congregation are welcome to come forward to pray over a person if they feel led to do so. Our 8:30 Contemporary service includes contemporary Christian songs and biblical teaching. 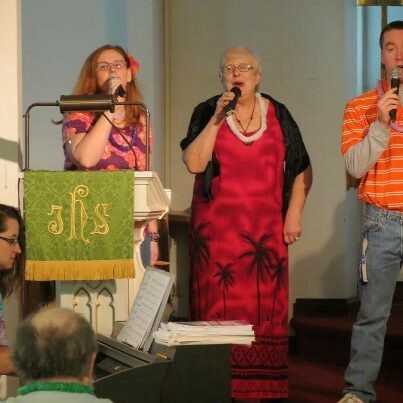 Our praise team is made up of piano, drums, bass guitar and rhythm guitar in addition to four or five singers each week. The Praise team leads the congregation in singing between five and seven contemporary Christian songs, such as you would hear on K-Love or Life 107.1, throughout the service. All parts of the service are projected on a large screen at the front of the sanctuary and available in a bulletin as well. Holy Communion is celebrated on the first and third Sundays of every month and all baptized Christians are welcome to participate. Children are welcome at all services and there is a Children’s message each Sunday for preschool through 6th grade. The weekly message lasts 10-20 minutes and there is often a member of the church who will give a “faith talk” testimony during the service as well. If you are interested in hearing an example of Pastor Broers’ messages, please download them here. Dress ranges from jeans and shorts to suits and dresses. 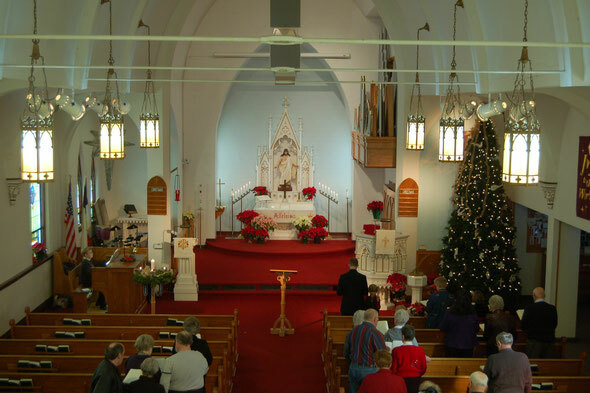 At the 10:30 Traditional service, we use a traditional Lutheran Liturgy found in the Lutheran Book of Worship (LBW) with accompaniment by a full pipe organ. All parts of the service are printed in bulletins both in regular and large print. Holy Communion is celebrated on the first and third Sundays of every month and all baptized Christians are welcome to participate. Children are welcome at all services and there is a Children’s message each Sunday for preschool through 6th grade. On most weeks, we sing four hymns from either The Lutheran Book of Worship (LBW) or the With One Voice (WOV) hymnal. The weekly message lasts 10-20 minutes. If you are interested in hearing an example of Pastor Broers’ messages, please download one from here. Baptism - Adults and Infants. Go here for more information. Communion - All baptized adults are welcome to participate. 5th grade youth and older can take first communion classes to participate. Go here for more information. G.R.O.W. (God Rocks On Wednesdays) - Wednesdays from 6:00-7:30. Meal is provided. 3 years through 6th grade. Go here for more information. 1st Bibles - Handed out at a special service to all 3rd graders. Confirmation - 7th and 8th Grades. Go here for more information.